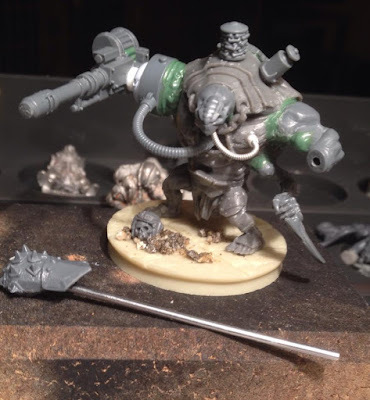 Work on the genemechanicus continues, this time focusing on one of the characters, magos Kurgan. Kurgan is based on an old Jes Goodwin model that I acquired in a trade. He'd seen better days, missing his horns and the end of his scythe, but he reminded me of some of the old adeptus mechanicus art I'd seen by John Blanche and Jes Goodwin, so he was put aside for later consideration. I rummaged around for some bits to 40k up this fellow. 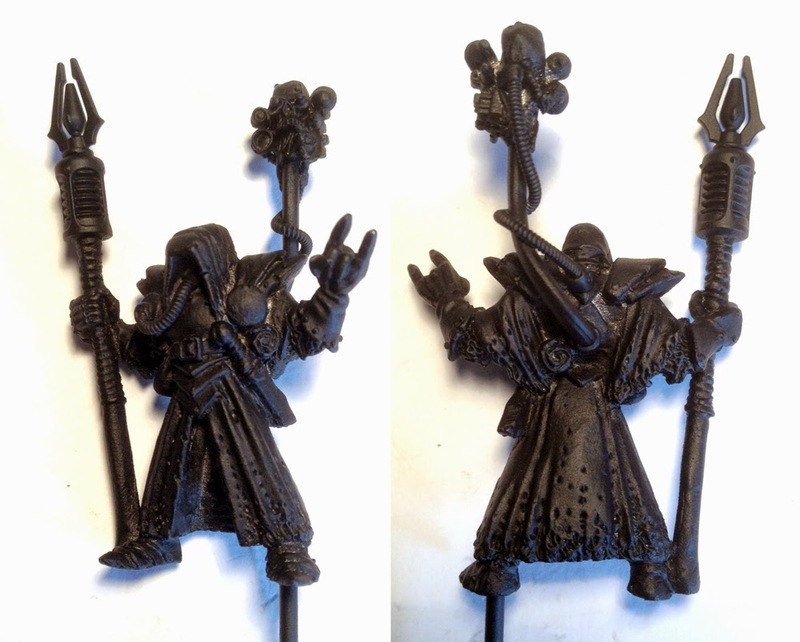 His plasma staff is made from bits from the ever useful talos kit. I'll paint the ribbed section of the staff like the fuel cells on a plasma gun. I've seen some people attach servo skulls directly to thier models, and this seemed like a great idea to give him a more mechanicus feel and mark him out as a character. The poseable cabling from Dragon Forge is a magical addition to any bits box, instantly adding sci-fi cred to any model. 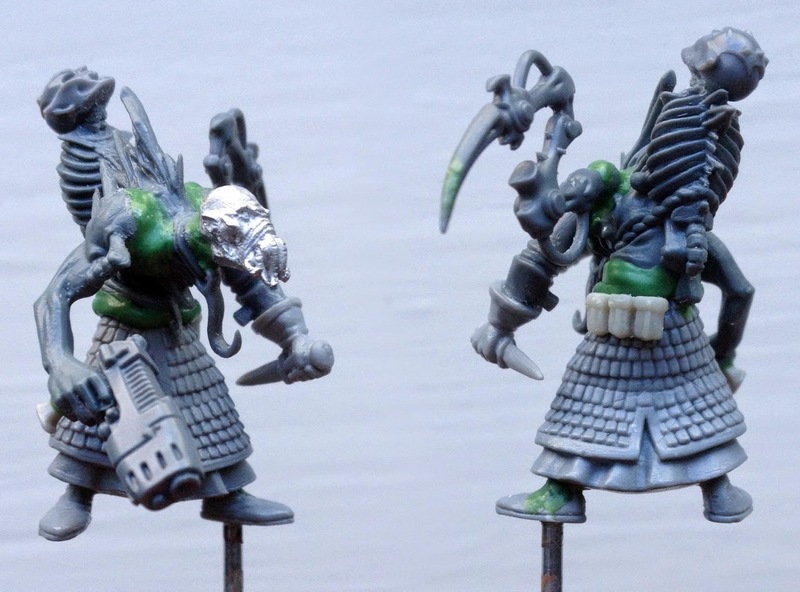 Some green stuff, and he was ready for priming. Here he stands now, awaiting some paint. I'm trying to get the first half a dozen members of the cult ready for an upcoming demo game at BroCon. Here are two more fellows awaiting some attention. Nothing like a deadline to keep you going. I've not had a ton of hobby time lately, so I've been just going nuts with the blu-tack in the little time I do have. I threw together this guy, an aberrant hybrid. 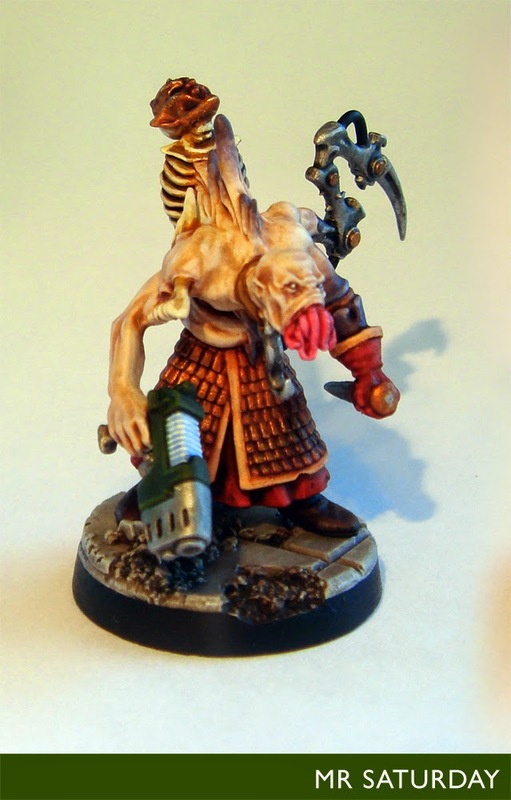 I'm guessing not every genestealer hybrid turns out super cool, and some are a little more deformed than others. These are then taken by their brethren and augmented to carry heavy weapons or combat attachments. 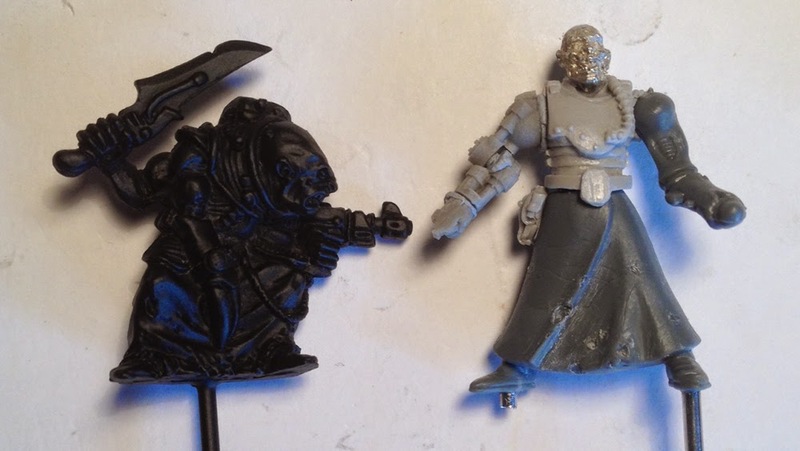 In game these will work as weapons teams, ogryns, and whatever else. I'd be super intrigued to get some feedback on ugly here. Bear in mind he still needs cables and other do-dahs. After some considerable tooing and frooing, the test model for the cult is done. Trying to marry the aesthetics of the Adeptus Mechanicus and a genestealer cult took some mulling, but I think I have a reasonable handle on it. Essentially whenever I come across a stumbling block I'll just refer to one of my Giger art books. Job done. The paint scheme came together once I lightened the skin, going much paler than originally anticipated. I did consider making it a much cooler tone, shading with blues and purples, but the fleshier shading sits better I think. The base is pretty neutral, which is as well considering the amount of colours in the scheme. Here's some more views of our neophyte and his late grandad. Next up will be some of his squad, including a particularly hulking 2nd gen special weapon carrier. With the first hybrid finished, it's time to look at the basing scheme for the cult. I wanted something very different from the swamp bases I've used for my last project, the fimir, so I went for ruined urban. After a search in the old internet, I found a nice set of resin bases from Dragon Forge, you can see them here. Mostly concrete with grates, manholes and so on. As the scheme for my cult has quite a few colours I want the basing to be pretty neutral, and you want get much more neutral than grey. Having said that, I didn't want the bases to be just mid-grey with a white drybrush, there has to be some points of interest, so once again I turned to the mighty interwebs to instruct me. I found a nice tutorial from Third Eye Nuke on urban basing which had a couple of choice tips. You can see it here. Craziest of all was a highlight of silver as the top highlight on the concrete. 'What in the hell? ', I said. 'Holy monkeys, it really works! ', I said a second or two later. Here's the scheme I went with. Base coat of light grey, I used the old Fortress Grey from Citadel. I based the grate with a 1:1 mix of Mechrite Red and Boltgun Metal. Wash all with Reikland Fleshshade. Wash the grate and recesses and such with Nuln Oil. Drybrush with Fortress Grey. Stipple flat areas a touch. Same again with Skull White. Drybrush with Necron Compound. Finally, work Typhus Corrosion into recesses and points of interest. You can use pigment here too, but I just goddam love Typhus Corrosion for the grainy texture. It's a weathering/dirtifying magic liquid, so it is. I'm pretty happy with the result, and it takes no time at all. No way man, we're like, totally just regular guardsmen. Lately, for the first time in decades, I've re-entered the grim darkness of the far future of warhammer 40k. This had been spurred on by a long-held desire to start a genestealer cult force and the encouragement of one's peers. 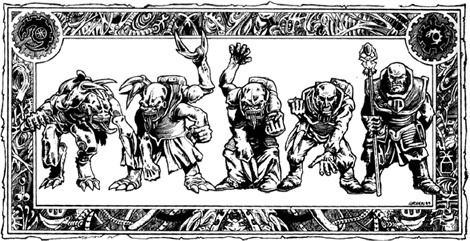 It's been a bit bewildering, coming as I do from the comfortable familiarity of Warhammer Fantasy where I have a pretty good handle on what's going on to a situation where I have no clue what the hell I'm doing. Despite this, I've tied down the bones of what I want to do and have set to it. With that in mind, and now that I've started work on the models, I wonder how vital WSIWYG is to 40k. It seems more essential than in the fantasy counterpart, where if a few models in a unit have shields and others do not it's no big deal as long as the unit is armed primarily with the weapon in the list. In 40k individual models are more focused on so it seems more important the model carries the appropriate weapon. Now, there's not too much pressure on me to make sure this is the case, and I'll model whatever looks best to me in the end anyway, but I'm curious how 40k players see this. I'm not talking about using a model with a missile launcher as a plasma gun or anything so extreme. I'm referring to, say, a unit with lasguns where some of the troopers might have a las pistol and knife or even an autogun, but most would be armed correctly. What's the take on this? I'm already confusing the issue by saying my squad of deformed hybrids are actually a squad of militarum tempestus scions. Would I be taken out behind the chemical sheds and given a good beating for such behaviour? After playing about with the blu-tack for ages, I finally committed and assembled my first hybrid. This is first sci-fi model I've put together in decades. Things have changed. Looking about the net for conversion pieces and bases, there's a bewildering array of companies doing all sorts of great stuff. I feel like an old beaky Rogue Trader marine who's been in stasis too long and is having issues coming to terms with modern times. Ol' Beaky sounds like a character that may epitomise my efforts to understand modern 40k. Prepare for comments like: "Back in my day, a marine was content with a jetbike if he wanted to go flying about." and "When I were a lad all we had was mark 6 armour, and we were happy." I have a vague idea of the first squad I want to do, a unit of ten hybrids with special and heavy weapon. The fellow below will be the leader, hence the plasma pistol. This isn't any old genestealer cult, but a corrupted adeptus mechanicus cult, there have to be a fair few bio-mechanical elements in there. Robes will be common, as well as pipes, servos and other Giger inspired monstrosities. This particular fellow has an altered third arm, which will function as a power weapon of some ilk. He still needs a little filing to smooth the green stuff, and I need to get the solder pen out and distress his robes a little, but apart from that, he's ready for paint. On that note, I've been looking at some potential colour schemes for the cult. As they are mechanicus, I'll probably stick to red for the robes and bronze for masks. That will be enough to identify them with the mechanicus, colour wise. Flesh will be pale, with some purple and red glazes where appropriate. Where implants meet flesh and so on. These are wayward mechanicus, and not as exacting as their more fastidious forebears. The thing that's giving me the most trouble is the carapace colour. You can see on the colour test, the third arm is still jarring. I may need to look at some natural reference for chitin and shell colours. The spot colour was going to be a cream, but I'm leaning more toward a medium flesh tone now, if the skin colour stays pale. I'd be interested in what way folks lean regarding their opinions on the schemes on our three friends below.